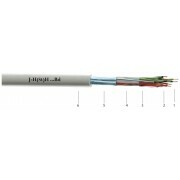 Cable standard : DIN VDE 0815. Conductor : DIN EN 60228 class 1. 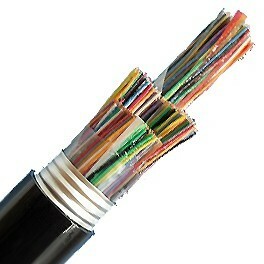 Insulation integrity : DIN VDE 0472-814/ 8.83, 180 min. Peak operating voltage : 225 V.
800 V at 50 Hz. Temperature range : fixed:-5° C till +50° C.
mobile:-30° C till +70° C.
Bending radius : in motion is 7,5 x diameter. 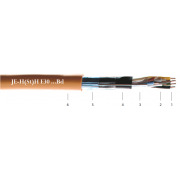 Laying temperature : -5° C...+50° C.
Insulation resistance : min. 100 MOhm/km. View / Download PDF Mail it! 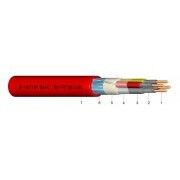 Fire resistant : EN 50226-2-4, EN 60332-1, IEC 60332-3 cat. C.
Insulation integrity : DIN VDE 0472-814/ 8.83 about 180 min. Circuit integrity : DIN 4102-12 according to VDE 0100-710 and 0100-718, about 90 min. Test voltage : conductor/conductor and conductor/screen is 800 V at 50 Hz. 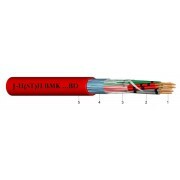 Fire retardant : EN 50266-204, IEC 60332-3 cat. C.
Peak operating voltage : 300 V.
Temperature range : fixed :-5° C till +50° C.
mobile :-30° C till +70° C.
Bending radius : 7,5 x diameter. 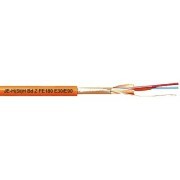 Insulation integrity : DIN VDE 0472-814/ 8.83. ﻿﻿Peak operating voltage : 225 V.